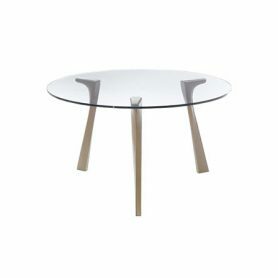 Trium by Matteograssi is a round table with a glass top designed by Stefano Bigi. Elegant and refined: the legs covered in leather with a meticulous play of seams give it personality and character. Matteograssi is a company that produces design furniture since 1880. 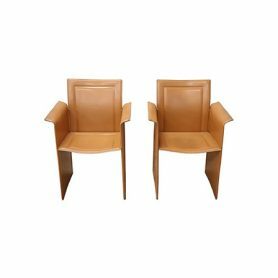 The Korium KM1 armchairs by Matteograssi are pieces of furniture made in the 1970s and designed by Tito Agnoli. Agnoli has created several design items for Italian luxury brands and has been repeatedly reported for the Compasso d’Oro. Covered in brown leather, these armchairs are perfect for decorating your home or office with in a vintage / retro style. Matteograssi is a company that produces design furniture since 1880. 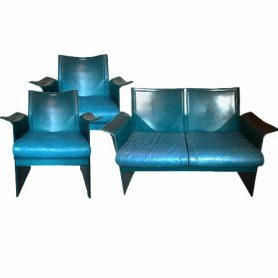 This sofa and the two Korium armchairs are precious vintage (1970-1979) furnishing items designed by the famous designer Tito Agnoli for Matteo Grassi. Agnoli has created several design chairs and armchairs for Italian luxury brands and has been repeatedly referred to the Compasso d’Oro. Set sofa and 2 armchairs Korium is ideal to furnish your home with vintage and retrò style.